association with division of Molecular Biology, Dr Mansoureh Eghbali. 1. Farhadi A., Parhizgar A., Rahman S. & Haghshenas M. (1999). Tuberculosis: The Most Common Cause of Fever of Undetermined Origin in Shiraz. Archive of Iranian Medicine. Vol 2: number 4. 2. Rahman S. Li J., Bopassa J.C., Umar S., Iorga A., Partownavid P. & Eghbali M. Phosphorylation of GSK-3b mediates Intralipid-induced cardioprotection against Ischemia/Reperfusion injury. Anesthesiology. 2011 Jun 17. Accompanied by an editorial view and news release. 4. 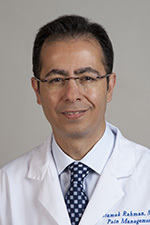 Li J., Bopassa J.C., Iorga A., Nadadur R.D, Rahman S. & Eghbali M. Intralipid, a clinically safe compound, protects the heart against ischemia-reperfusion injury more efficiently than cyclosporine-A. Anesthesiology. 2012 Oct;117(4):836-46. 6. Rahman S. (2010). Epidural Morphine,"The Essence of Analgesia and Analgesics",edited by Sinatra R., Jahr J., Russell D., Editorial Director, Cambridge Press. Page 181-184. 7. Rahman S., Partownavid P. (2011). Regional Anesthesia for Chronic Disease States. ” Essentials of Regional Anesthesia”, edited by Kaye A.D., Urman R.D., Vadivelu N. Springer Science+Business Media, LLC, Page 541-556. 8. Rahman S., (2012). Opioids.” Miller’s Anesthesia Review” Edited by Sdrales L., ELSEVIER, Chapter 7, Page 74-72. 10. Rahman S. (2009). Deep vein thrombosis prophylaxis: friend or foe. Am J Ther. 16(4):300-3.